What's here for the mega-fan? Spielberg, Oprah, JJ Abrams, Reese Witherspoon. 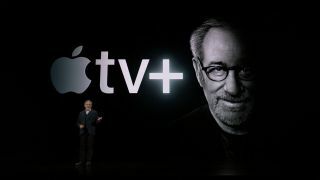 Apple rolled out some of the biggest names in Hollywood and entertainment for its Apple TV Plus launch last night, as it tried to show the world it was serious about entering the world of TV production. It’s got everything – a Jason Momoa-fronted post apocalyptic thriller, a Sesame Street spin-off for the little ones, a couple of Oprah documentaries for the big ones. Everything, right? Well, almost everything. Apple TV Plus is missing a key ingredient if it’s looking to hit the ground running in its quest for TV viewing dominance, and that’s a big, recognized franchise. The competition all have at least one. Netflix has Star Trek with Star Trek Discovery and will soon have The Witcher. Amazon Prime is about to get a Lord of The Rings show. Disney has some absolute killers on the way with its in-the-works Disney+ service, in the shape of multiple Marvel superhero and Star Wars TV shows. The importance of these franchises is significant, and particularly so for a brand new player entering the market. Whether it’s a spin-off from a storied film franchise, the first onscreen re-imagining of a much-loved book, or even seeing a video game story brought to life in live-action, it’s an opportunity to tap into an existing, hungry fanbase. And that’s what Apple has left itself without. Sure, there’s talent attached, but there’s no ‘Star Wars’, no ‘Harry Potter’, no ‘James Bond’. In other words, there’s no guaranteed audience. Apple will argue that it doesn’t matter – it’s got that all covered by iTunes and the new Apple TV Channels service, that will let you bundle up whichever other broadcast TV and streaming services (other than Netflix of course) that you want, and roll all their content up into a single unified user interface. There’s sure to be this sort of thing there, right? Yep, probably. But that still doesn’t help Apple push TV Plus to the mega-franchise fan, the person who can’t live knowing that there is a little corner of their favorite fictional universe they’ve yet to explore. In large part, as ever, it will probably come down to pricing. As yet, we don’t know exactly how much Apple TV Plus is set to cost, or precisely how much exclusive content it’s going to offer. If it’s, say, $5 or £5 a month for 20ish shows, that seems a reasonable chunk to part with initially to find if there’s a show there you’re going to like. But if it’s $10? Or $20? On top of your existing Netflix or Amazon Prime or Hulu subscription? That’s a harder sell. But $20 to see the new adventures of Boba Fett? I’m sold.